Russian authorities have blacklisted an anti-fascist activist group whose members are on trial on charges of plotting to overthrow the government as a terrorist organization. The FSB added Set to its list of terrorist organizations Monday based on a recently enforced court order. The group joins the likes of the Taliban, al-Qaeda and the banned Islamic State terrorist organization. Russia’s state financial watchdog had added members of the left-wing group to its list of terrorists months earlier, the OVD-Info police-monitoring website reported. Ten members of the group now face up to 10 years of prison on terrorism charges. 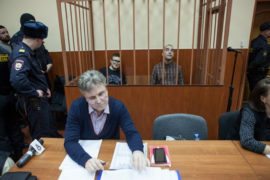 The first member of the group, Igor Shishkin, was sentenced to 3.5 years in January after making a deal with the investigators. Hearings for two of the suspects, Viktor Filinkov and Yuly Boyarshinov, have been postponed until Wednesday.